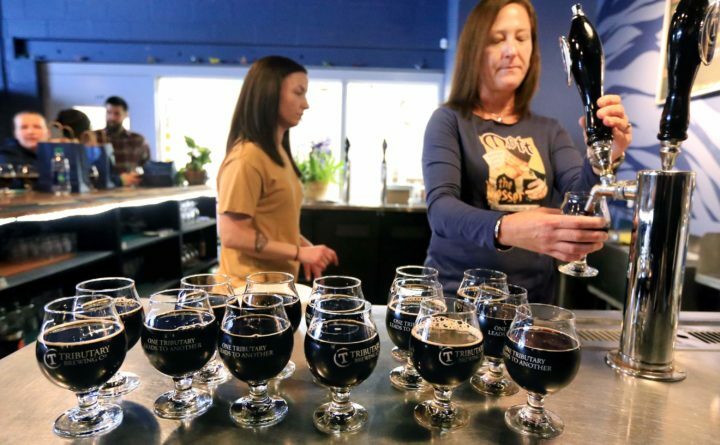 Ashley Couillard, left, and Tonia Timme Cloutier serve glasses of beer at Tributary Brewing in Kittery in this April 2018 Seacoast Online photo. Tributary owner Tod Mott told Kittery Water District officials Monday their planned switch to chloramines as a new drinking water disinfectant, even if temporarily, could force him to install a new $5,000 filter system. KITTERY, Maine — Kittery Water District users expressing concerns Monday over the announcement of chloramines as a new drinking water disinfectant included beer brewers worried about their product, gardeners distressed about potential soil and wildlife impacts, and residents with health issues they say could be exacerbated by the chlorine and ammonia combination. The informal discussion between water users and Water Superintendent Michael Rogers took place at the Kittery Community Center’s Star Theatre, with upwards of 30 people in attendance to address the public notice issued last week, announcing the Water District, servicing users in Kittery and Eliot, will begin administering chloramines to prepare for the final phase of its water treatment plant renovation, and then continue with it going forward as good emergency preparedness. Though deemed a safe and effective drinking water disinfectant by the Environmental Protection Agency, and consumed regularly by one in five Americans, chloramines kill household fish, amphibians, and other aquatic creatures, impact production processes at bakeries and breweries, and can’t be used in kidney dialysis machines. 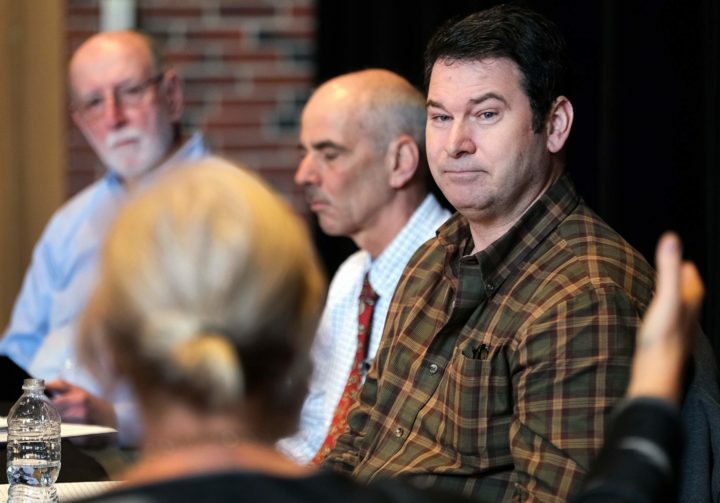 Kittery Water District Superintendent Michael Rogers listens to residents' concerns Monday over the district's planned use of chloramines as a drinking water disinfectant. “We want you to feel confident that the water we’re going to be sending to your homes and businesses is safe to drink,” he told those in attendance at the informal Monday morning meeting. There are also concerns the disinfectant releases lead from old pipes. Chloramines can be filtered out through specialized carbon filters. Rogers on Monday confidently defended the Water District’s decision to move to chloramines, noting it doesn’t have much of a choice for at least two specific time periods over the next two years. Due to the ongoing water treatment plant project, for one week this year, and three months next year, the Kittery Water District will have to purchase water from the York Water District and the Kennebunk, Kennebunkport and Wells Water District, which both use chloramines. Water incompatibility is not an option, Rogers said, and would result in poor taste, odors and color issues. The water treatment plant, which had reached the end of its design life, is currently in year two of a $3 million three-year renovation project, and three consecutive months in 2020 will require a complete shutdown of the plant. Rogers called it “the most disruptive phase by far,” one that required planning years in advance. He also emphasized the planned eventual use of chloramines had been publicized in the Water District’s annual reports. Some water users expressed distrust with the fact the public notice was sent out with just a few weeks in advance. Chloramines are scheduled to go into effect in April. Kittery resident Julia O’Connell said she’d been researching chloramines since the public notice was sent out. For people who are immune-compromised, she said, chloramines can cause additional health issues. She was also concerned about the possibility of a water main break leaking chloramines into a body of water, and potentially harming wildlife. 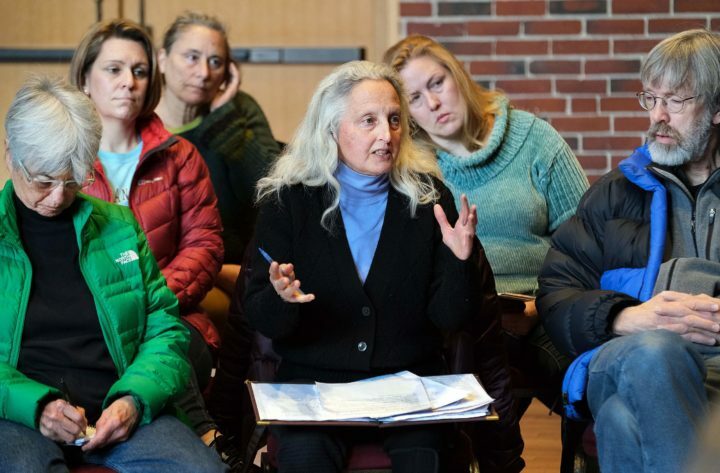 Julia O'Connell, center, was one of about 30 people to attend an informal meeting with Kittery Water District officials Monday morning to discuss the district's planned use of chloramines as a drinking water disinfectant. She said she's worried the additive will exacerbate her respiratory problems. Rogers said the Water District has already begun increased testing for lead to prepare for the change, and adjusted pH and phosphate levels accordingly, as recommended by Wright-Pierce engineers. “I firmly believe we have taken the right approach,” Rogers said, noting the transition to chloramines should be “seamless” and customers likely won’t notice any change. Kittery business owners Tod Mott and Patrick Rowan expressed it was a matter of livelihood for them. Mott, owner of Tributary Brewing, and Rowan, owner of Woodland Farms Brewery, would be uniquely impacted by chloramines. Unfiltered water would result in a plastic-like taste of beer. Both said they are looking at a $5,000 installation of a larger carbon filter system, if the town goes forward with chloramines. Mott said he’d like to see some tax relief for businesses that have to spend money on alleviating the disinfectant. Rowan said chloramines will have an “immediate effect on our business” and impact his bottom line. He said a batch of beer brewed with unfiltered chloramines would not be drinkable. When reached for comment, co-owner of Beach Pea Baking Tom Roberts said he is hopeful an activated carbon filter will do the trick but, “maybe our bread will be terrible the next day and we’ll know.” Roberts said he was frustrated “they would move this so quickly without a referendum or anything like that,” and with no compensation for impacted business owners. Christine Bennett, of Eliot, said she has the means to purchase a whole house filter, but “there are thousands of people within this water district who are not in a position right now to safeguard against the chloramines.” She asked if the Water District could potentially facilitate a “group purchase” of water filters. Water users were generally understanding that chloramines will have to be added to the water during the two planned occasions along the treatment plant project schedule, but many asked if outside of those times, and going forward in the future, the water could remain chloramines-free. “If we take water with chloramines and mix it with the water we have (right now), the two don’t play well together,” Rogers said. “We feel that it’s the best thing to do, to be compatible with our neighbors.” The Kittery Water District produces 1 billion gallons of water per year, and Portsmouth Naval Shipyard gets 42 percent of the water produced daily. Attendees requested the Water District schedule another public meeting during the evening, so more people could attend. “We want you to feel confident that the water we’re going to be sending to your homes and businesses is safe to drink,” he said.